Second only to Barack Obama's lack of US citizenship, the Rumor That Refuses to Die award rightfully belongs to the Microsoft Zune Phone - and today a date was finally ascribed to that elusive hardware's release. According to Trip Chowdhry of Global Equities Research, as quoted by Barron's, the release of the iPhone competitor is imminent. Eric Savitz of Barron's - echoed by the Silcon Valley Insider - suggests that the Zune Phone (the Zone?) will be announced by Steve Ballmer in his CES keynote on January 7th. Frankly, we at The Reg are more than a bit jaded by the seemingly endless stream of Zone rumors. For example, nine months before the iPhone appeared Ars Technica asked "Will Microsoft beat Apple to the punch with the all-in-one, digital-music-playing phone?" and answered its own question with "It sure seems like Microsoft is scrambling to do so." Rather slow scrambling so far, don't you think? 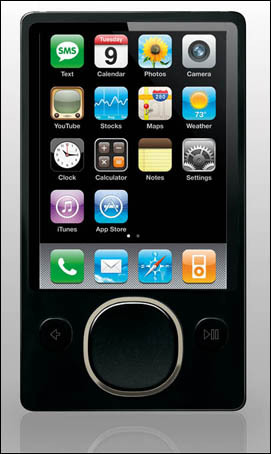 In February of 2007, Crunch Gear announced that it had "received a sound tip that Microsoft is working on its very own phone to be branded under the Zune moniker." Gizmodo concurred with that prediction, claiming that their "own tipster" convinced them that it was "almost 100% confirmed that the Zune phone is coming." To quote Bill Clinton, the accuracy of these two Zone predictions hang on what the defintion of "is" is. In December 2007, ZDNet predicted that "Windows Mobile phones [would] get Zuned" in 2008. Twenty-three days remain until we can check that rumor off our list. That said, the most recent speculation that January 7 might see the Zone's coming out party is more believable than most past rumors. One reason is that it'll be nearly a year since Microsoft acquired Danger, makers of the well-received T-Mobile Sidekick - those smart fellas and gals should have had enough time to phonify the Zune by now.